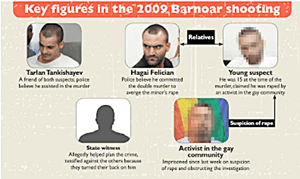 Israeli police are asking a well-known Tel Aviv gay activist to admit to molesting a gay teen so that they can prove that he was known to the three men suspected in the horrific 2009 shooting spree at the LGBT youth club Bar Noar that left two people dead, many wounded and resulted in one of the largest manhunts and most expensive investigations in Israeli history. The relative, now 19 years old, denies he was ever molested. Louisiana Theater Gunman Identified And He’s A God Fearing ‘Mericun Tea Party Terrorist!